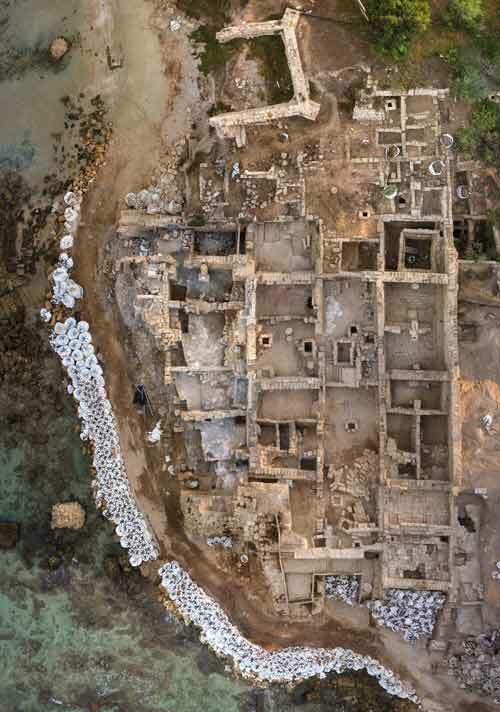 In September 2013 and May–September 2016, archaeological excavations were conducted at Caesarea harbor (Area LL; Permit Nos. A-6901, A-7664; map ref. 189988–90036/712165–222). The excavations, undertaken on behalf of the Israel Antiquities Authority and financed by the Caesarea Development Corporation, were directed by U. ʽAd, Y. Arbel and P. Gendelman (ceramics), with the assistance of Y. Amrani and E. Bachar (administration), L. Yehuda (ceramics), Y. Gorin-Rosen (glass), R. Mishayev, M. Kahan and R. Liran (surveying and drafting), A. Peretz and M. Dinstein (field photography), A. Peretz (Bosnian-Mandatorian finds), E. Kamaisky (pottery restoration), O. Yagel (metallurgy), A. Dayan (marble and kurkar artifacts), A. van Zuidan (plaster samples), Z. Adler and D. Siboni (conservation), Y. Shaltiel, O. Rosenthal and A. Greenfeld (planning), J. Sharvit and D. Planer (marine excavation), M. Johananoff and D. Syon (metal detection), the Griffin Company and D. Zell (aerial photography), K. Saʽid, Y. Saʽad, B. Goodman-Tchernov, J. Sheffer and the staff of managers and employees at the Caesarea National Park. The excavation area was located north of Caesarea’s inner harbor, which was in use from the Herodian period to the Byzantine period, near the northeastern corner of the Crusader harbor compound (Fig. 1). 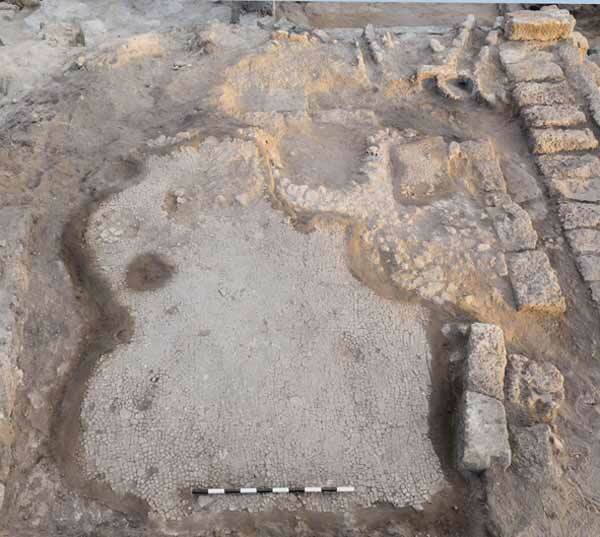 Previous excavations unearthed the northeastern and southeastern sections of a large complex, where goods were apparently stored as part of the activity that took place at the port (Levine and Netzer 1986; Stabler and Holum 2008). According to the previous excavators, the complex was built in the Late Roman period and continued to be used in the Byzantine and Umayyad periods. Part of a street running in an east–west direction and flanked by shops was discovered north of the complex; it was also dated to these periods. Dwellings, storage structures and installations, as well as drainage channels and either drainage or septic pits survived from the Abbasid and Fatimid periods. During the Crusader period, a fortification overlooking the entrance to the harbor was built in the southwestern part of the area, as the adjacent civilian settlement apparently continued to exist. Several finds were attributed to the Bosnian settlement in Caesarea, which was established in the 1880s and ended in the 1940s, following numerous changes. Excavations carried out in 2013 and 2016 (Figs. 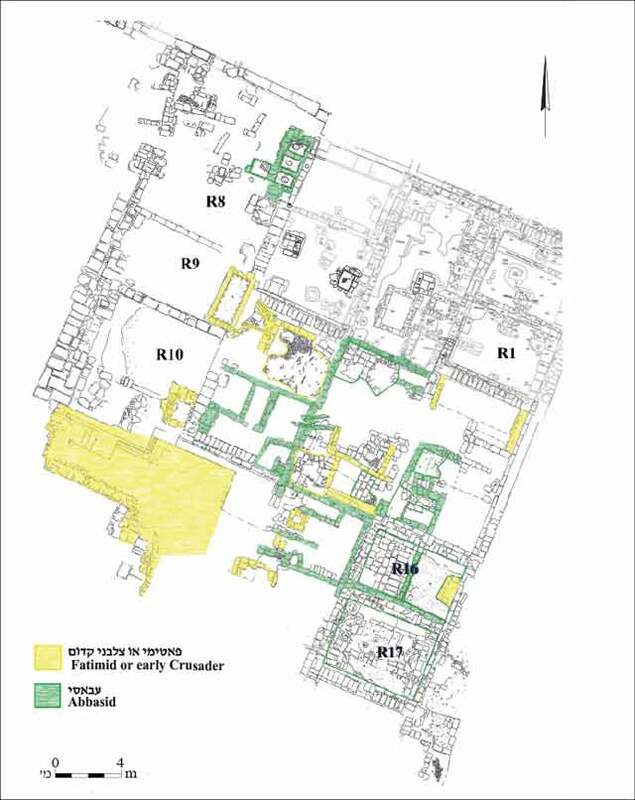 2, 3) uncovered the central part of the complex: a wide, north–south corridor flanked on either side by rows of large rooms founded on vaults, probably storerooms. 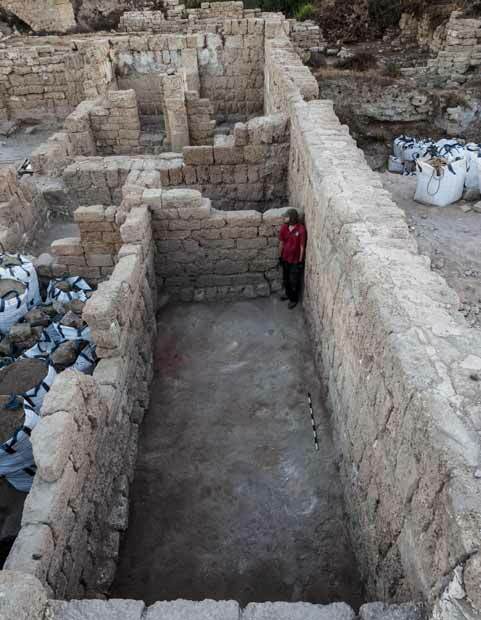 A storage structure (henceforth: warehouse) found in the western part of the area was also exposed; it was constructed in the Herodian period and continued to be in use, as it underwent changes, until the Umayyad period. The northeastern corner of the aforementioned fortification of the Crusader harbor was also revealed. In the excavations in 2013–2016, thirteen strata (Table I–XIII; Table 1) had been identified, some of which were found in Area LL and are described below. The Herodian–Roman Periods (Strata XIII–XI). Remains from these periods were discovered mainly in the western part of the excavation (R8–R11); however, the limited exposure prevented drawing a clear plan. 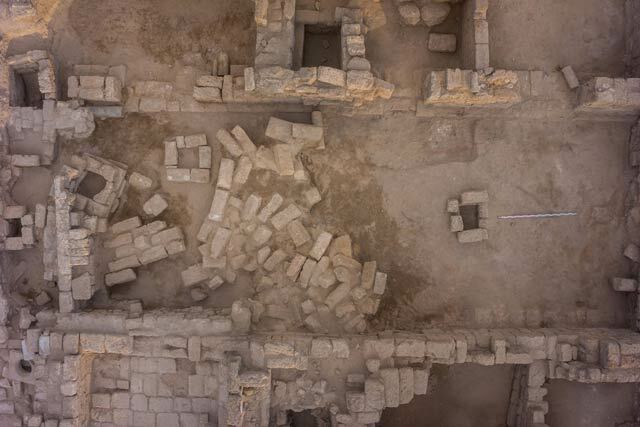 The finds from the Herodian period included a wide wall (2.2 m) that delimited the storage complex on the west and a stone pavement that abutted the western face of the wall. During the Roman period, a narrower wall was erected east of and parallel to the wall; the two walls enclosed a wide hall (c. 8 m). 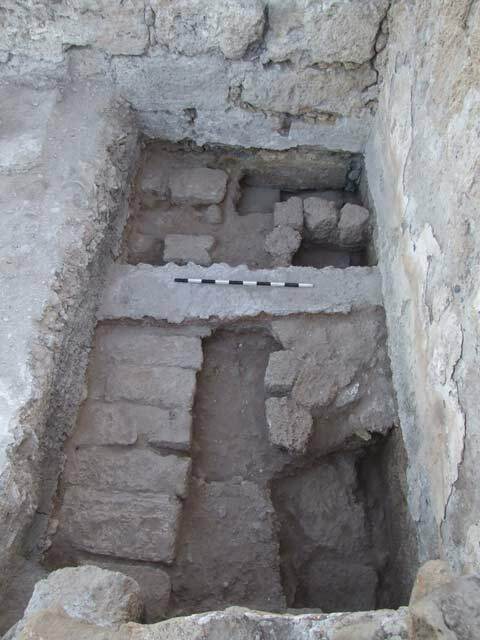 Probes excavated in this structure yielded two perpendicular walls and two or three floors that adjoined them, which were dated to the Roman period. One of the floors was paved with large flagstones (Fig. 4). A layer of light-colored soil from this period was exposed in a probe east of the wall and the hall. The Late Roman and Byzantine Periods (Strata X–VII). The large storage complex that served the port is attributed to these strata. The complex consisted of two warehouses, an eastern one and a western one, that shared a common wall—the Roman-period wall, which continued to be used in these strata; no passage was found between the two warehouses. The western warehouse (R8–R11) was excavated almost in its entirely, and four rooms that are wider than those in the eastern warehouse were exposed. Four pillars built in Room 8 probably served as bases for arches that supported a dome or a cross vault. The floors in Rooms 8 and 9 consisted of crushed and tamped kurkar, the floor in Room 10 was made of poured gray plaster, and a mosaic floor inlaid with potsherds rather than tesserae was revealed in Room 11. The eastern warehouse (R1–R3, R12–R17), part of which was uncovered in the previous excavations, was completely unearthed in this excavation. It comprised a main corridor (R2) paved with a white mosaic enclosed within a red frame (Fig. 5) and two wings with rooms facing the corridor on the east and west. The floors in the rooms, made of crushed and tamped kurkar, were founded on vaults oriented along an east–west axis. Stone pillars discovered in the center of Rooms 3 and 15 were apparently intended to support the floor of a second story. Locally produced bag-shaped jars were found shattered on the floor in Room 12. The rooms were built above vaulted spaces. The space beneath Room 17 was completely excavated; it was found filled almost to its ceiling with an accumulation of soil that had penetrated it during the Fatimid period. The floor in the space was paved with kurkar and river pebbles. Pottery sherds, mostly from the Byzantine period, were found on the floor. Thus, the construction date of the storage complex cannot be determined with certainty at this point, but the complex was probably first used at the end of the Roman period or in the early Byzantine period. The Umayyad Period (Stratum VI). The findings of the current excavation are consistent with the conclusions of the previous excavators of the site: the Byzantine complex continued to be in use in the second half of the seventh century CE, after the Muslim conquest, when rooms were partitioned, floors were raised, construction was added and some of the openings were sealed. The doorways of some of the storerooms were found blocked, and it was evident that the floor levels throughout the complex had been raised. 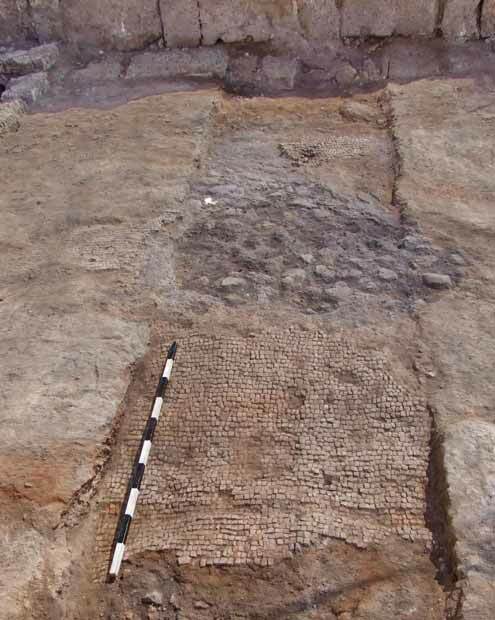 The mosaic floor in the main passage of the eastern warehouse was covered with a layer of mortar and tamped earth; similar floors were found in the storage rooms. Several of the rooms uncovered in the current excavation had been divided, as were Rooms 1 and 3, discovered in the previous excavations. The new walls were built of dry construction consisting of a single row of stones in each course (Fig. 6). A staircase built of ashlars in secondary use led to a second story or to the roof of the building and was affixed to the eastern side of the blocked opening of Room 15. Dozens of amphorae imported from the Aegean region and dating to the second half of the seventh century CE were found in Room 12 (Fig. 7). 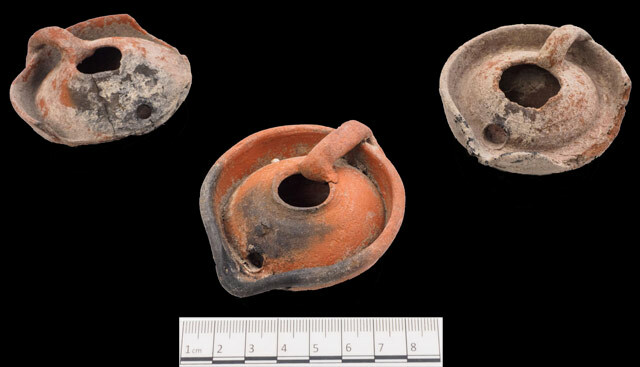 They were discovered above the locally produced bag-shaped jars of the Byzantine period (above) and were separated from them by a thin layer of soil. The concentration of amphorae suggests that the storage complex continued to be in use. 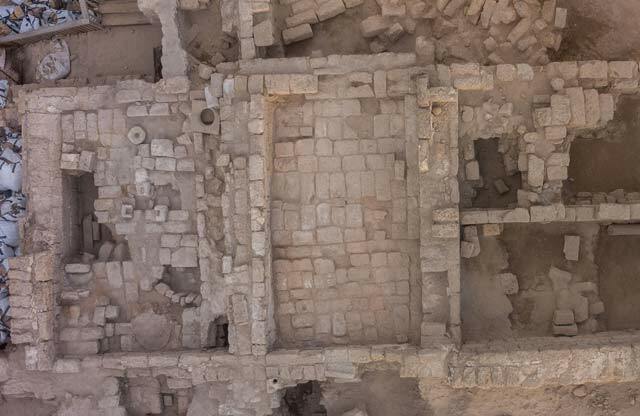 However, the possibility that the building was used as a dwelling cannot be ruled out; this may be indicated by the wide range of Umayyad-period cooking utensils and local and imported tableware found in the complex. Warehouses and dwellings from the Umayyad period are rare in Caesarea; consequently, the architectural complex from this period exposed in Area LL is of great importance. 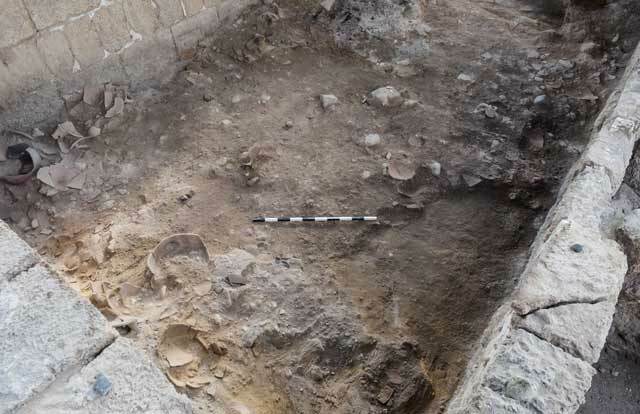 The ceramic finds indicate that the Umayyad settlement at the site ended at the end of the seventh century CE under unclear circumstances, and that there was a significant settlement hiatus, of at least half a century, before the settlement was renewed under Abbasid rule. While the site was deserted, there were at least two major destruction events that occurred, apparently the result of natural causes rather than deliberate action. These events caused severe damage in the western and eastern warehouses and toppled some of their walls. In the first incident, several ceilings collapsed inward, and there was evidence of a fire in the eastern warehouse. In the second incident, a layer of sand and collapsed building stones had accumulated to a height of more than 2 m in Rooms 8–11 in the western warehouse and to a height of 1.5 m in Rooms 12–14 and the corridor of the eastern warehouse. In parts of the collapse in the corridor, the original order of the courses of the wall or vault could be clearly identified (Fig. 8). The Abbasid and Fatimid Periods (Strata V–IV) (Fig. 9). The settlement at the site resumed in the mid-eighth century CE and continued until the end of the Crusader period. The layers of collapsed stones and sand were not removed during the renewed construction, as the builders preferred to level the area and build above the destruction layer. Some of the building stones and outer walls of the destroyed Byzantine complex were incorporated in secondary use, with no relation to their original plan. The new structures were used primarily as dwelling, as could be inferred from their method of construction: the walls were rather thin, and most of the floors were of tamped earth and plaster. At least four sub-phases were identified in a stratigraphic analysis of the remains. Subsequent building additions obscured the earlier construction lines, so that in most cases it was impossible to delineate the original plan of the rooms. The dimensions of Rooms 16 and 17 and their stone pavements were exceptional (Fig. 10). In Room 17 there were industrial installations, mortars and tabuns, which belonged to several phases. Lamps (Fig. 11) and whole juglets from the eighth–ninth centuries CE were found on the floor in Room 16. The stone pavement in this room was later covered with a poured plaster floor, as well as two floors of tamped earth and plaster. Similar changes were evident in the doorways. 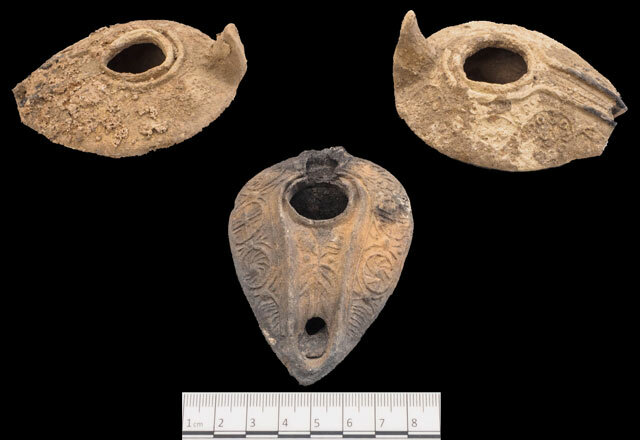 Many wells, cisterns and cesspits belonging to the Islamic strata contained a wealth of finds, including whole lamps from the Fatimid period (Fig. 12). Four plastered industrial installations from the Abbasid period were discovered in the northeastern corner of the western building (Fig. 13), above the destruction layer that sealed the Byzantine-Umayyad warehouses. The Crusader Period (Stratum III) (Fig. 3). Two structures are attributed to this period: the northeastern corner of the massive fortification in the harbor and a room paved with a coarse white mosaic composed of pebbles and tesserae from an industrial mosaic in secondary use (Fig. 14). The room was constructed above the collapse that sealed Room 12. Crusader potsherds incorporated in the pavement of the room attest to its date, as does its stratigraphic location above the Abbasid-Fatimid level. A channel drained water from the roof of the building into a deep, plastered cistern dug into the collapse that sealed Room 9 in the western warehouse. It is likely that some of the drainage cisterns and wells date from the Crusader period. In addition to a small quantity of pottery sherds, some of which are imported, the period is represented by coins and several glass vessels. Three arrow heads characteristic of the period were also found. At this stage of the research, it is impossible to determine to which of the two phases of this stratum (IIIa or IIIb) the remains should be attributed. The Bosnian-Mandatory Presence (Stratum II–I). Maps and aerial photographs indicate that the early twentieth-century Bosnian settlement did not include Area LL, but rather extended only as far as its eastern fringes. This contradicts the conclusions of previous excavators who thought that some of the installation walls in this area should be attributed to this settlement. Remains of a refuse pit, apparently from the second or third decade of the twentieth century, were revealed at the eastern end of the area; these contained cartridges of a British rifle, several fragments of porcelain vessels and small tin containers resembling the cans of meat used by the British army during World War I. The ammunition and tin cans seem to indicate that the refuse pit is not related to the Bosnian settlement but rather to a nearby military post. Several fragments of Marseilles roof tiles were found in the topsoil in several places. Such roof tiles were imported to Israel primarily from the late nineteenth century until the early decades of the twentieth century CE; other examples have been discovered elsewhere on the site, where the Bosnian village was located. The results of the excavation confirm most of the conclusions drawn by the previous excavators. 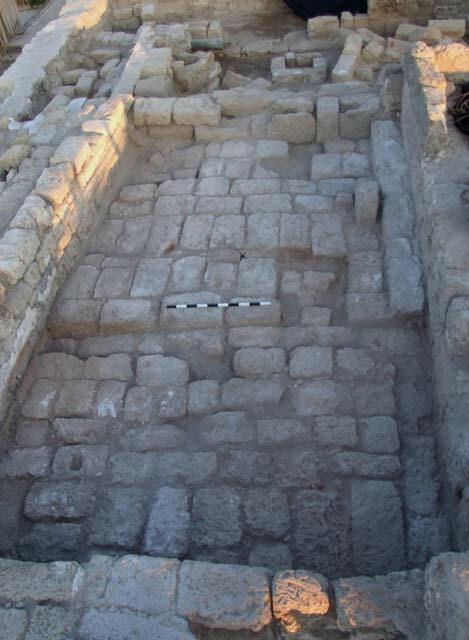 The excavation did not clarify whether the buildings were erected at the end of the Late Roman period, as demonstrated by finds from the bedding of the corridor floor in the eastern warehouse, or at the beginning of the Byzantine period, as evidenced by one of the vaults below the rooms of the eastern warehouse. The exposure of the main part of the warehouse structure completes its plan. The concentration of jars found in one of the rooms and the predominance of storage vessels in the overall ceramic assemblage, reinforces the identification of the complex as a warehouse associated with the harbor. 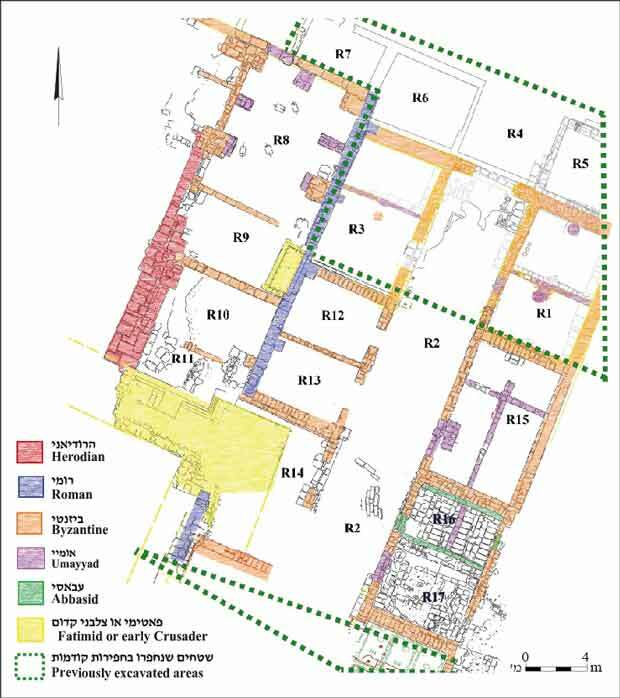 Changes in the plan of the building and additions that divided its rooms in the Umayyad period, a phenomenon recognized by previous excavators, were also discerned in the current excavation. The accumulation of sand and debris that covered the building attests to a significant natural event that interrupted its use or, as the ceramic finds seem to suggest, destroyed some of its walls when the building was already abandoned. The area was reinhabited during the Abbasid period, when new structures, which probably served as dwellings and workshops, were erected on top of the collapse and the sand. This activity continued in the later phases of the Abbasid period, during the Fatimid period and perhaps even in the Crusader period, when this section of the harbor complex was fortified. The destruction and abandonment of Caesarea at the time of the Mamluk conquest is reflected in the absence of finds that date from the fourteenth century to the beginning of the nineteenth century CE. The Bosnian settlement extended only up to the edge of Area LL, and no building from the village was found in this area. Levine L.I. and Netzer E. 1986. Excavations at Caesarea Maritima 1975, 1976, 1979—Final Report (Qedem 21). Jerusalem. Stabler J. and Holum K.G. 2008. The Warehouse Quarter (Area LL) and the Temple Platform (Area TP), 1996–2000 and 2002 Seasons. In K.G. Holum, J.A. Stabler and E.G. Reinhardt eds. 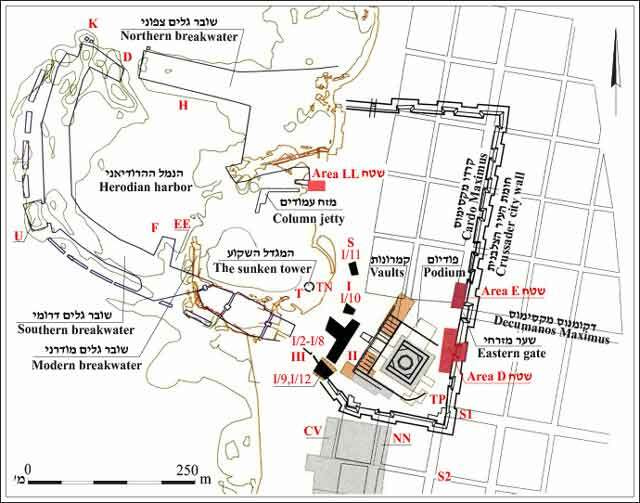 Caesarea Reports and Studies: Excavations 1995-2007 within the Old City and the Ancient Harbor (BAR Int. S. 1784). Oxford. Pp. 1–39. 2. The excavation, aerial photograph looking north. 4. Building remains and Roman floors in a probe, looking north. 5. A section of the Byzantine mosaic floor and the floors from the Umayyad period in the main passage, looking east. 6. An Umayyad wall dividing a Byzantine storeroom, looking north. 7. The concentration of amphorae from the Umayyad period, looking northeast. 8. Wall collapse, looking west. 9. The late phases, plan. 10. A paved Abbasid room, looking west. 1 Lamps from the Abbasid period. 12. Lamps from the Fatimid period. 13. The room (left) in which industrial installations from the Abbasid period were found, looking west. 14. The floor of the Crusader building, looking west.